Here I was thinking that I am going to have a serene and peaceful time at my home… enjoy sleepy afternoons in the sultry and humid andd rain filled heat of Kolkata. But hey! Peace is far away if you look at all the movies being played around you. Kung Fu Panda 2 – it one of those movies which I would come back from dead to watch! I loved the Kung Fu Panda 1 and when the ever so adorable Po comes back, you have to go watch it!!! X-Men First class – Well it was indeed FIRST CLASS!! Brilliant and although I saw a couple of technical faults, I enjoyed it thoroughly! Pirates 4 and Hangover 2 did not strike me as great… could say it was a nice time pass. Saw and forgot about it too! And now that M F Hussain’s death is all over the news, I missed Baba so much that I had write about him! This and the other reason being the post written by Tanmay. Especially the debate following it! Don’t you see? I had to write my own thoughts out! It’s for his defense – says he! Scallywags – says I again! A satyagrahi does not need an army, perhaps goons do! I was talking to my dear friend “Baba Romanov” from Mumabai… You see he was very upset that the state government has raised the age bar on drinking! He says he plans to go on a hunger-strike till the government revokes this decision! After all hunger strike seems to be the flavor of the season! But my point being that you cannot hold the government by its collar to serve your whims! However noble your intentions are, you don’t get to blackmail the government. I get it that this might be the “most corrupt government ever” but I have till now not seen any other government that was not so! Shame… Indian politics is not run by angels! Be it this side or the other they all have their FAIR SHARE in corruption… so it would be better if they decided to just check themselves and not others. As far as the people are concerned, Indians would do better to use their own rationale and not walk along blindly! And speaking of waking, I was talking to this other friend of mine, Shri DKC ji Maharaj, from Delhi. He expresses his anger in the way the Baba had caused the traffic mayhem in Delhi! Very Bad! One couldn’t even walk! It’s very hot in Delhi and perhaps the heat is getting into him! – Says Shri DKC. Baba Ramdev is great man when it comes to yoga. So great that he has a few thousand crores worth of business. After all eleven thousand crore is a lot! So much that I can’t even count the number of zeros in it. And there I was, thinking that Baba ji is a great sanyasi and so poor that he couldn’t even shave his own beard! Boy! Now I wanna be a baba too – says an 8 year old boy sitting beside me! Bringing the black money home will give our beloved corrupt politicians an elephantine chance to gobble down more money! – Says I! But apart from that… it’s no joke and let us not fuel one man’s hopes of raising his political aspirations and gaining even more popularity! Baba ji, you are already very popular and rich! I would ask you to use that power which you can wield rightly and not take advantage of the great love that your fan following has for you. People including me, respect you for yoga and lengths you have taken to spread this ancient art . But playing politics does not suit you! IF he uses this popularity gained due to yoga to his advantage then I must say that somebody said and I agree that this man has commercialized everything! He claims to cure AIDS and even Homosexuality (which by the way is not even a disorder or a disease!) whatever miracles (if any) he has performed is all due to yoga. So let us thank Dr. (Mrs.) Jayashankar who too runs a yoga clinic in my locality. 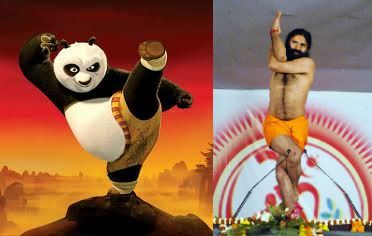 I thank all the yoga gurus in this world… Ramdev ji you are not special you see! I do not know if your drive against corruption will ever yield any result but it has indeed inspired me start a school for future babas with certificate courses! After all, I feel that now a lot of people will turn to Babagiri so why not take advantage! Maybe I too will have a few crore soon! P.S. – Sorry Mr. Hussain I did not write about you! You see, I get so confused with your work. One hand you have such wonderful masterpieces and on the other – such controversial ones! Sadly you leave us but the controversies remain! Also for the literarily ignorant people, this is a satire which was not inspired by a political party but sheer truth as I see it!